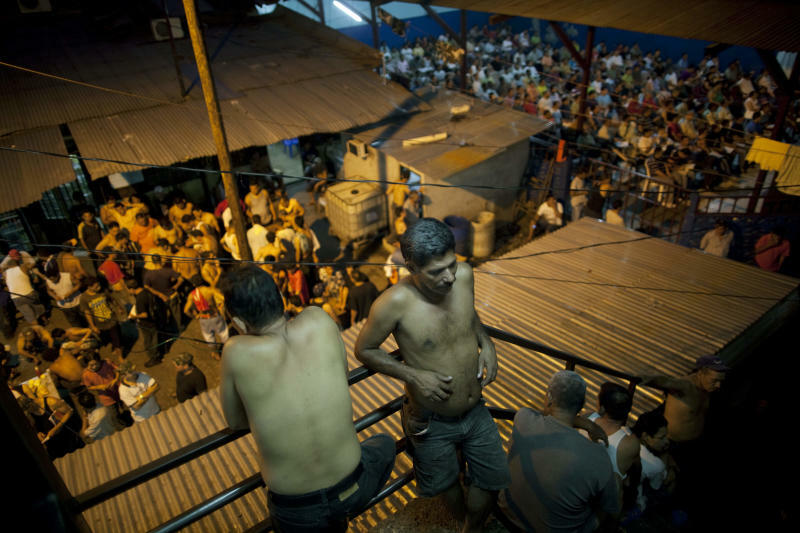 SAN PEDRO SULA, Honduras (AP) — Inside one of Honduras' most dangerous and overcrowded prisons, inmates operate a free-market bazaar, selling everything from iPhones to prostitutes. It's more like a fenced-in town than a conventional prison, where raccoons, chickens and pigs wander freely among food stalls and in troughs of open sewage. But guards do not dare cross the painted, yellow "linea de la muerte" (line of death) into the inner sanctum run by prisoners, and prisoners do not breach the perimeter controlled by guards. "The prisoners rule," assistant prison director Carlos Polanco told The Associated Press. "We only handle external security. They know if they cross the line, we can shoot." 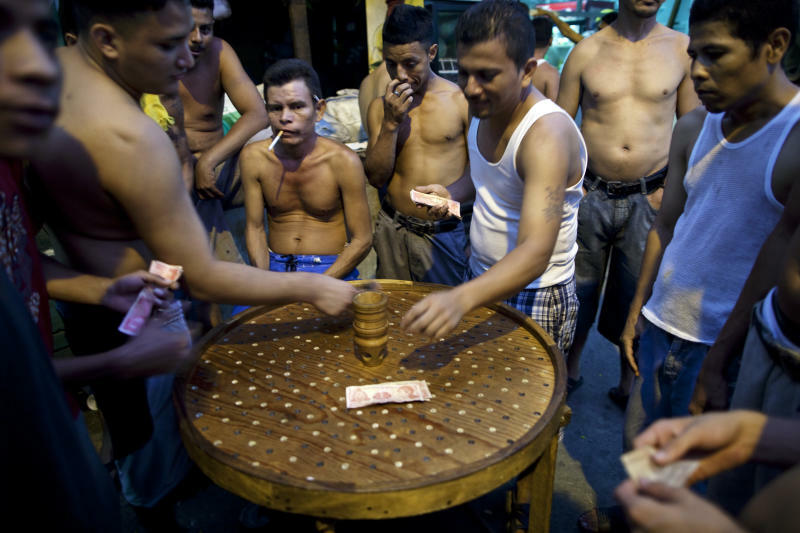 The unofficial division of power at the San Pedro Sula Central Corrections Facility is mimicked throughout the country, where a Lord-of-the-Flies system allows inmates to run a business behind bars, while officials turn a blind eye in exchange for a cut of the profits they say is spent on prison needs. This culture virtually guarantees that even in the glare of international scrutiny over a fire that killed 361 prisoners at another Honduran prison three months ago, little stands to change. Just one month after the fire at Comayagua prison, convicts at San Pedro Sula turned on their leader, killing 14 people and taking over the prison for three weeks before officials could get inside. Less than two weeks ago another inmate was killed and 11 wounded in a brawl. The AP this month toured the prison in San Pedro Sula, where 2,137 inmates live in a space built for 800. Journalists gained access not through the prison director but with permission from the head inmate, Noe Betancourt, who provided a team of eight prisoners as security. No guards went inside the bustling, autonomous town, where women and children mill about the stalls selling Coca-Cola, fruit, T-shirts, hammocks, shoes and rugs. Some 30 people enter from outside every day to work the market. The guards typically keep to an area between two sets of locked doors. The first set is locked against entry to the outside world. Between those doors, and the doors to prison cells, lies the yellow line. Prisoners keep to their side of it so religiously that the doors to the indoor market and the cells are unlocked during the day. At night, guards do venture in to lock the cells, inmate Betancourt said, but inmates have keys and crowbars, because in case of fire, "the police would run away and leave us in here." A thickset middle-aged man who gave his prison tour accompanied by his girlfriend, Betancourt is responsible for taking charge of new inmates and explaining the fees, which include cell space. Prices range from 1,000 lempiras ($50) for the worst cells to 15,000 lempiras ($750) for cleaner, more secure living space. Inmates who can't afford to pay anything sleep on the floors and get the worst jobs, such as cleaning. Betancourt was "elected" to his post by his fellow inmates last month after his predecessor made the mistake of sharply raising fees. The boss, Mario Enriquez, was widely hated for abusing prisoners, beating deadbeats or hanging others from the ceiling overnight, dogs biting at their toes. But after he hiked the costs of cells, food and other privileges, enraged inmates attacked him. They cut off his head, cut out his organs and fed his heart to his dog. Then they killed the dog, according to inmates whose account was confirmed by authorities. Thirteen of the leader's band were murdered too, their bodies buried under mattresses and set afire. After the killings, inmates continued to control the prison for three weeks, not allowing officials or firefighters in to investigate the blaze, according to San Pedro Sula prosecutor John Mejia. The dead bodies were handed over to the prison guards. As in the case of the Comayagua prison fire, no charges have been filed in those deaths. 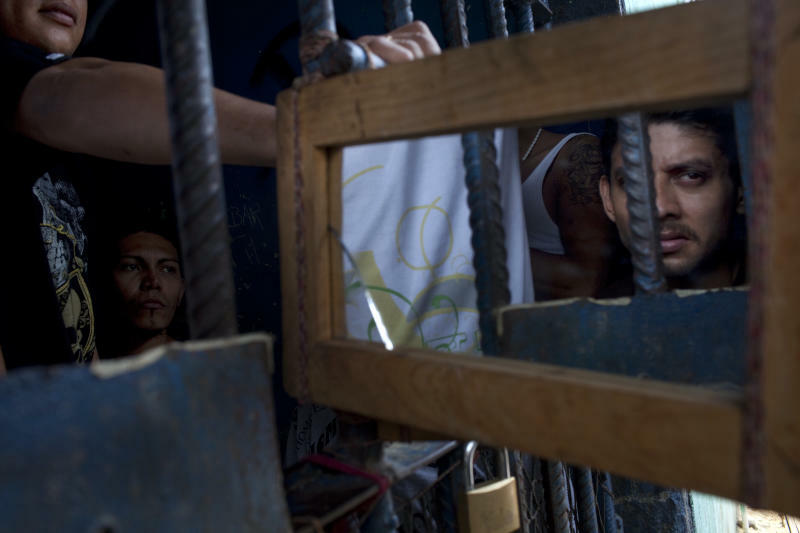 At Comayagua, the prison director was dismissed, but the guards who fled and left men to burn in their cells that night were reassigned to other prisons, said Danny Rodriguez, the prison's new director. Rodrigo Escobar Bil, an investigator with the Inter-American Commission on Human Rights, said the country's prisoners deserve better. "It's likely that something grave will happen in the future in Honduras' prisons, given that the situation hasn't changed from what existed three months ago," he said after touring a prison last month. The U.N.'s Honduras Subcommittee Against Torture reported in 2010 that corruption pervades the entire system, from prison staff to outsiders, ensuring "a silence ... a guarantee of impunity." The prison is heavily overcrowded, with bunks bunched up side by side in large cells. Throughout the tour, prisoners could be seen visiting with their wives and playing with their children. Prison clerks wearing blue jackets, never stopped moving, carrying packages of food, tobacco or money sent from family members. In one corner, a band with an electric guitar practiced while in another a group watched Real Madrid play soccer on TV. Starting at about 75 lempiras($3.50) a week, inmates can pay to have their floors cleaned or air conditioning repaired. They can buy beer at three times the street price, drugs and a night with a woman. The profits are distributed among the workers, stall owners, and the prison administration, Polanco said. The administration cut is 120,000 lempiras ($6,000) a month, which pays for maintenance, gas to transport prisoners to court or the hospital and to serve better food, said Hugo Hernandez, San Pedro Sula prison administrator. "The state gives us 13 lempiras per inmate (about 60 cents) a day for food. With that money they would starve, so I have to find a way to cover the rest," he said. Prison officials openly acknowledge their complicity with prisoners as a fact of life in a country that spends roughly $250 per year on each of 12,000 inmates crowded into a system built for 8,000. "For some it's corruption," Polanco said, "but for us it's the only way to keep the system from breaking apart." Inmate Jorge Gutierrez runs a restaurant with specially designed, laminated menus featuring double hamburgers, pupusas and other popular dishes. He pays 480 lempiras ($25) a month to the prison administration to run his business, employs two fellow prisoners as waiters and said he still makes enough to support his family on the outside. Gutierrez said when he is freed, he can rent or sell his business to another prisoner. "No way would I want to be transferred to a new prison," he said. "I would lose my privileges." The Inter-American Commission on Human Rights said the Honduran government has all but abandoned its penitentiary system. The report drew similar conclusions as that which followed a 2004 fire in the same prison that killed 107 inmates: a tinderbox of overcrowding, overloaded electrical systems and a lack of trained personnel to respond in a crisis. "Honduras is a country with few resources," said Honduran Security Minister Pompeyo Bonilla. "We've asked the International Monetary Fund to be more flexible with its criteria for issuing new debt so we can deal with our prison problem." At Comayagua, the fire spread quickly, fueled by clothing, bedding, cooking oil and other belongings of prisoners in rows of bunks only inches apart. The same conditions exist in San Pedro Sula, where the human rights commission also condemned as deplorable its lack of hygiene and adequate food and potable water. Fernando Ceguera, a prisoner who maintains the electrical system, showed 12 overloaded transformers that leak oil and spark whenever it rains. "They could explode at any minute," he said. Assistant Security Secretary Marcela Castaneda recently said in Washington that Honduras plans to build at least two new penitentiaries, noting that some facility are far more overpopulated than San Pedro Sula, one as much as 235 percent. But the plans lack financing. San Pedro Sula has had a committee to build a new prison for 10 years and is still waiting for the state to give it property to build on. Prison boss Betancourt, meanwhile, said he is already working on a design and getting price quotes to build new cells in the current facility, adding a second story above its chapel and dining room. "Working ourselves with $10,000," said Betancourt, "we can build the capacity of the prison by 500 inmates."